Yesterday was the annual joint Assembly Ways and Means and Senate Finance Mental Hygiene Hearing or as I call it this year—the COLA fest. During the eight hours of the hearing, I counted eighteen different Senators and Assembly members in attendance—-all of them (with maybe the exception of one or two) spoke out strongly in support of a Workforce COLA for our sector. Of the over dozen advocacy groups that testified from Mental Health, Alcoholism/Substance Use and Developmental Disabilities, every one of us spoke in support of a workforce investment. I don’t know how anyone could have left that hearing room without the understanding that a workforce investment is the top priority for virtually every human services agency in New York State. Listed below is MHANYS testimony where we lead off by making the case for the human services COLA as well as the importance of a dozen other issues. Thank you to the members of the joint Assembly Ways and Means and Senate Finance committee for holding this hearing. We would like to especially acknowledge our Assembly Mental Hygiene Chair, Aileen Gunther for her great work in advocating for the Mental Health Association and for all our colleagues across New York State. I would also like to welcome back our former Mental Hygiene Chair in the Senate, David Carlucci. During his first tenure, Senator Carlucci was a strong advocate for the priorities of our organization as well as for the entire sector. We know that he will continue his strong support for our initiatives. My name is Glenn Liebman and I am the CEO of the Mental Health Association in New York State, Inc. (MHANYS). Our organization is comprised of 26 affiliates in 52 counties. Many of our members provide community based mental health services including housing, peer services, jail-based services, school-based services, care management, employment and a gamut of other services. Our members help positively impact thousands of New Yorkers with mental health related concerns. Our organization also is value driven and takes our core mission of raising awareness about mental health and ending the stigma of mental illness very seriously. In recent years due to the work of many of you and the Executive, we have been able to greatly raise visibility of mental health and wellness. Notably, New York State became the first State in the nation to have an income tax check off dedicated specifically to ending the stigma of mental illness. 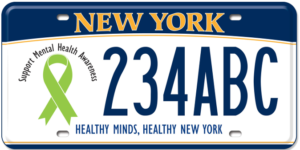 We are also the first state in the nation to have a license plate specifically dedicated to mental health awareness. And of course, due to the work of all of you and the Governor, New York became the first State in the nation to make it mandatory to teach mental health in schools from K through 12. This will be discussed in greater detail in the testimony. Like most mental health budgets, this year is a mixed bag. There are some things we are very appreciative of including continued funding for the School Based Mental Health Training and Resource Center, the State’s continued commitment to Reinvestment, Suicide Prevention and Housing and the State’s strong commitment to behavioral health parity. There are also some glaring omissions in the budget as well most notably as it pertains to the Cost of Living Adjustment (COLA) to the Human Service Workforce. We have broken down all our issue areas with specific recommendations related to each issue. When you are reading this, I would ask that you look at this as the lens of an individuals with a serious mental health issue or that of a family member such as myself and think about how important each of these issues are as it relates to helping dramatically improve the lives of people with mental health related issues. For over a decade there has been statutory language in the budget that includes a COLA for the human services workforce related to the CPI. And every year outside of the first year and one year when the CPI was .02%, the COLA was not withstood in the Executive Budget. We estimate that by not including the statutory COLA for most of the last decade, we have lost over five hundred million dollars to our human services not for profit workforce. This year the CPI is at 2.9% for our not for profit sector which is $140 million. Behavioral Health is an integral part of that sector including mental health and alcoholism and substance abuse. The impact of not having a COLA has a real impact for real lives. Think of the crisis we have with the opioid epidemic, the rise in suicide attempts and completions, the increase in the number of people with mental health needs who are incarcerated or homeless and the long waiting lists for services and housing. There are so many good things that happen every day through the work of community providers to mitigate those devastating outcomes but so much more can be done with appropriate funding. The entire behavioral health sector measured the impact of turnover and vacancy rates through member surveys. The results are included at the end of this document but the major take away is that statewide there is a 34% turnover for jobs in our sector, meaning that over the course of a year, over a third of people in the behavioral health not profit sector leave for other positions. This speaks to the invaluable need to have the funding to ensure continuity of care for individuals to help in their recovery and insure recruitment and retention of a quality workforce. Who are people who comprise this workforce? According to our colleagues at Strong Not Profits, 82% of the human service workforce is comprised of women and over 40% are individuals of color. Many of these individuals are working second and third jobs to make ends meet. Not only is this a workforce issue, but it is a social justice issue as well. The Legislature and the Governor deserve a great deal of credit two years ago when you provided funding for the direct care workforce in developmental disabilities and behavioral health but a fully funded COLA will provide funding for the entire sector to help respond to this crisis. We strongly urge your support for this funding. The entire behavioral health community speaks with one voice in urging your support for funding $140 million in the budget for a 2.9% COLA for the human services not profit sector. As I earlier referenced, we are proud that our great State was the first in the nation to make it mandatory to teach about mental health in schools. Our movement in New York has spurred discussion across the nation. We have been contacted by over a dozen states about their interest in doing something similar to what we have done in New York. Not only is it a nationwide movement, but there is international interest. Our organization has received inquiries from as far away as Senegal. not begin until July of 2018. It has been a very smooth transition and schools deserve a lot of credit for embracing adding mental health to health curriculums. Many schools already have embraced mental health in schools and for others this new law is helping to create a mental health and wellness climate that is new to their school. In last year’s budget, one million dollars in funding was established to create a School Mental Health Resource and Training Center run through our organization. We want to thank the Assembly for their strong support for this funding especially Assembly Mental Hygiene Chair Aileen Gunther. Center including statewide staff available for technical assistance and training as well as a dynamic interactive website. The Center supports school’s efforts in sustaining K-12 mental health instruction and providing professional development to school personnel. Since the inception of the program, we have over 11,000 people who have visited the website www.mentalhealthednys.org. In addition, we have facilitated over sixty professional development trainings to over 3500 individuals. Also, what is most impressive is that even though we started the Center in September, we have reached over 60% of schools across New York State. We have utilized our funding to greatly enhance the knowledge about mental health in schools across New York State. This is an issue that all the major Statewide Educational organizations recognize as a major priority area. We thank them for their strong support of the Center. We also want to recognize the work of Commissioner Elia at the State Education Department and Commissioner Sullivan at the Office of Mental Health. Both are dynamic leaders who have raised the bar about mental health in schools through their support and the development of the Mental Health Advisory Committee comprised of education and mental health professionals across New York State. We were pleased that Governor Cuomo added $1.5 million in the budget for mental health in schools. $500,000 of this funding is dedicated to help support the Resource Center. To continue to support the mental health needs of students, teachers, administrators and other school personnel, we need your continued support to continue the Resource Center. In the New York State Public School System, we on average spend $22,000 a year per student. We can fund The School Mental Health Resource and Training Center for an additional .33 cents per student. This small investment will impact the lives of thousands of New York’s young people across the State. Please support adding one million dollars in funding to continue the work of the Resource Center. Over the past several decades the funding for the various New York State Office of Mental Health sponsored/licensed/funded mental health housing programs in New York State that are home to people with mental health related needs and those in recovery, has not kept pace with inflation, rising administrative costs and the increasing demands of services people with co-occurring conditions and the management of complicated medication regimens. New York is the national housing leader in caring for those with mental health related issues. However, without increased resources, many housing providers will face difficult challenges in reducing the number of units to meet financial challenges. Currently, there are approximately 40,000 New Yorkers with serious mental health related issues participating in these housing programs. These vulnerable residents usually enter the system from state psychiatric centers, prisons and jails. Housing providers can receive $7600 to $25,000 per person per year, depending on housing model and geography—these levels make it very difficult for providers to insure quality of care for the people that we serve. By adequately funding community based mental health housing, taxpayers will not have to pay for the costs of more expensive hospitalization, emergency care, incarceration and homelessness. We are appreciative that the Executive Budget includes a proposed $10 million for housing, but the need is much greater. As member of the Bring It Home campaign, we urge support for additional funding for community housing. We are recommending that there be $32 million added a year for the next five years to continue to fund existing housing. In 2013, MHANYS played a role in helping to ensure that hospital beds that closed in State psychiatric hospitals would be reinvested back in community support. To date, there has been over $100 million added in the budget for community support to help pay for crisis residence, housing, jail diversion programs, peer run programs, family engagement programs and much more. This funding has helped change the lives of people with mental health related issues. MHANYS strongly support the $5.5 million in the Executive Budget and urges continued support for community investment. MHANYS and our members across the State strongly support the Joseph Dwyer Peer to Peer Project for Veterans. Several of our members proudly work in conjunction with other local agencies to run programs in their counties. In the five years that the Dwyer Project has been funded, it has proven to be a very successful model for veterans to engage in services and work with their peers in an environment that is free of stigma and bias. Personally, speaking through our organization, there are few things more rewarding to our members than to work with our true heroes in helping them find the support and services that they need and get their lives back. Every year we are honored to have veterans attend our Mental Health Matters Legislative Day and every year we receive testimonials from veterans about what the Dwyer project means to them. The Executive Budget did not include any funding for the Dwyer program. Over the last several years, the Senate has been able to provide funding to continue this program. We urge the Legislature to continue to fund the Dwyer project and advocate for greater engagement of families in the funding model. disorders in jails and prisons to be forced into solitary confinement. In addition, we are strongly supportive of Crisis Intervention Teams (CIT). several of the teams around New York State. We urge your continued support and advocacy on behalf of the HALT Bill. There was no new funding in this year’s proposed Executive budget for CIT. The Legislature has been strong supporters of CIT and we urge your support for the continuation of funding and to identify additional counties for expansion. We are strongly supportive of recent changes to Behavioral Health Parity. The first is the passage of the new parity law. We are very appreciative of all your support in passing a bill that will shine greater light on plans that are not living up to the tenants of Timothy’s Law by denying behavioral health benefits to individuals. This new law will insure that there will be greater accountability and scrutiny through public information portals through the Department of Financial Services (DFS) that identifies plans that are denying benefits at a high percentage. The second part of this change is contained in the Executive Budget. This funding will provide for greater scrutiny of health plans based on hiring of more staff at DFS and DOH who will be better able to monitor plans. In addition, the State’s ombuds program will help insure that people who are denied benefits have an entity to voice their concerns. Mental Health First Aid is a best practice that helps provide individuals with tools to help respond to an individual in a mental health crisis. MHFA is also proven to be a successful training in helping to reduce the stigma of mental illness. In New York State, MHANYS and our affiliated chapters provide training in every part of New York State. We train law enforcement, educators, older adults, veterans, human service workers, individuals who work with transitional age youth, librarians and the general population. Through the support of the New York State Senate, originally started through Senator Carlucci and continued when Senator Ortt was the chair, we have received funding to provide the eight-hour MHFA training throughout New York State. There was no funding in this year’s Executive Budget for Mental Health First Aid. We urge support for $100,000 in funding to continue the work in educating our members and through them the entire State on Mental Health First Aid. This year’s proposed budget eliminates the protection of Prescriber Prevails to all drug classes including mental health medications. If an individual needs medication that is not on a plan’s formulary, they should be able to get the protection of prescriber prevails. Clinical providers in concert with the individual should be identify appropriate medications. It should not be driven by a formulary but by an appropriate prescriber. Add back budget language that insure that prescriber prevails remains a safeguard for individuals with mental health medication as well as all other individuals on Medicaid. MHANYS is advocating for a complete legislative review of the progress being made since the passage of the Geriatric Mental Health Act of 2005, with the goal of enhancing and strengthening the impact of the Geriatric Mental Health Services Demonstration Grant Program and the Interagency Geriatric Mental Health Planning Council. As the science has progressed in this area, there is growing recognition of the mental health needs of individuals as they age. Since the Act was passed in 2005, there has been $2 million in the budget every year to fund the demonstration project. This number has not changed in 14 years. We urge support for a funding increase from $2 million to $4 million in this year’s Executive Budget. In addition, we urge that there be a legislative hearing to help draw attention to the mental health needs of aging New Yorkers. This year’s Executive Budget proposed the elimination of the protections of the Justice Center for OMH and OASAS certified programs and services in general hospitals including inpatient psychiatric units. We completely disagree with this proposal. By eliminating some of the jurisdiction of the Justice Center, it is undercutting their ability to continue their mandate of protecting vulnerable New Yorkers. This also creates a bifurcated system of care. Does this say that hospitals are better at protecting vulnerable populations than providers in the behavioral health? All vulnerable New Yorkers should be protected equally no matter what setting they are in. Reject the language that calls for the elimination of OMH and OASAS certified programs and services in general hospitals from the jurisdiction of the New York State Justice Center. Our organization was in the news recently highlighting our concerns about the legalization of recreational marijuana. It is important to make a distinction between recreational marijuana and medical marijuana We have urged caution in moving forward in regard to recreational marijuana. As we know from science, the human brain is not fully formed till age 25. The impact of cannabis to still forming brains can have deleterious effects. We also know from the DSM 5 that symptoms of mental health related issues such as depression and schizophrenia can be impacted by marijuana use. Moving forward towards legalization, we urge caution and a recognition of the mental health impact to marijuana use. While we completely support expunging the records of low-level offenders, we recommend a series of preventative tools. Recommendations include changing the age of legalization to age 25 when the brain is more fully formed, label warning about impact to mental health, education curriculums in schools dedicated to impact of marijuana to mental health, PSA’s and impact studies. We know that the Legislature has been a friend to our organization and to the mental health community. We urge your continued support and cooperation.